The scattered disc (or scattered disk) is a distant circumstellar disc in the Solar System that is sparsely populated by icy small solar system bodies, which are a subset of the broader family of trans-Neptunian objects. The scattered-disc objects (SDOs) have orbital eccentricities ranging as high as 0.8, inclinations as high as 40°, and perihelia greater than 30 astronomical units (4.5×109 km; 2.8×109 mi). These extreme orbits are thought to be the result of gravitational "scattering" by the gas giants, and the objects continue to be subject to perturbation by the planet Neptune. Because of its unstable nature, astronomers now consider the scattered disc to be the place of origin for most periodic comets in the Solar System, with the centaurs, a population of icy bodies between Jupiter and Neptune, being the intermediate stage in an object's migration from the disc to the inner Solar System. Eventually, perturbations from the giant planets send such objects towards the Sun, transforming them into periodic comets. Many objects of the proposed Oort cloud are also thought to have originated in the scattered disc. Detached objects are not sharply distinct from scattered disc objects, and some such as Sedna have sometimes been considered to be included in this group. Traditionally, devices like a blink comparator were used in astronomy to detect objects in the Solar System, because these objects would move between two exposures—this involved time-consuming steps like exposing and developing photographic plates or films, and people then using a blink comparator to manually detect prospective objects. During the 1980s, the use of CCD-based cameras in telescopes made it possible to directly produce electronic images that could then be readily digitized and transferred to digital images. Because the CCD captured more light than film (about 90% versus 10% of incoming light) and the blinking could now be done at an adjustable computer screen, the surveys allowed for higher throughput. A flood of new discoveries was the result: over a thousand trans-Neptunian objects were detected between 1992 and 2006. The first scattered-disc object (SDO) to be recognised as such was 1996 TL66, originally identified in 1996 by astronomers based at Mauna Kea in Hawaii. Three more were identified by the same survey in 1999: 1999 CV118, 1999 CY118, and 1999 CF119. The first object presently classified as an SDO to be discovered was 1995 TL8, found in 1995 by Spacewatch. As of 2011, over 200 SDOs have been identified, including Gǃkúnǁʼhòmdímà (discovered by Schwamb, Brown, and Rabinowitz), 2002 TC302 (NEAT), Eris (Brown, Trujillo, and Rabinowitz), Sedna (Brown, Trujillo, and Rabinowitz) and 2004 VN112 (Deep Ecliptic Survey). Although the numbers of objects in the Kuiper belt and the scattered disc are hypothesized to be roughly equal, observational bias due to their greater distance means that far fewer SDOs have been observed to date. Known trans-Neptunian objects are often divided into two subpopulations: the Kuiper belt and the scattered disc. A third reservoir of trans-Neptunian objects, the Oort cloud, has been hypothesized, although no confirmed direct observations of the Oort cloud have been made. Some researchers further suggest a transitional space between the scattered disc and the inner Oort cloud, populated with "detached objects". The Kuiper belt is a relatively thick torus (or "doughnut") of space, extending from about 30 to 50 AU comprising two main populations of Kuiper belt objects (KBOs): the classical Kuiper-belt objects (or "cubewanos"), which lie in orbits untouched by Neptune, and the resonant Kuiper-belt objects; those which Neptune has locked into a precise orbital ratio such as 2:3 (the object goes around twice for every three Neptune orbits) and 1:2 (the object goes around once for every two Neptune orbits). These ratios, called orbital resonances, allow KBOs to persist in regions which Neptune's gravitational influence would otherwise have cleared out over the age of the Solar System, since the objects are never close enough to Neptune to be scattered by its gravity. Those in 2:3 resonances are known as "plutinos", because Pluto is the largest member of their group, whereas those in 1:2 resonances are known as "twotinos". In contrast to the Kuiper belt, the scattered-disc population can be disturbed by Neptune. Scattered-disc objects come within gravitational range of Neptune at their closest approaches (~30 AU) but their farthest distances reach many times that. Ongoing research suggests that the centaurs, a class of icy planetoids that orbit between Jupiter and Neptune, may simply be SDOs thrown into the inner reaches of the Solar System by Neptune, making them "cis-Neptunian" rather than trans-Neptunian scattered objects. Some objects, like (29981) 1999 TD10, blur the distinction and the Minor Planet Center (MPC), which officially catalogues all trans-Neptunian objects, now lists centaurs and SDOs together. The MPC, however, makes a clear distinction between the Kuiper belt and the scattered disc, separating those objects in stable orbits (the Kuiper belt) from those in scattered orbits (the scattered disc and the centaurs). However, the difference between the Kuiper belt and the scattered disc is not clear-cut, and many astronomers see the scattered disc not as a separate population but as an outward region of the Kuiper belt. Another term used is "scattered Kuiper-belt object" (or SKBO) for bodies of the scattered disc. Morbidelli and Brown propose that the difference between objects in the Kuiper belt and scattered-disc objects is that the latter bodies "are transported in semi-major axis by close and distant encounters with Neptune," but the former experienced no such close encounters. This delineation is inadequate (as they note) over the age of the Solar System, since bodies "trapped in resonances" could "pass from a scattering phase to a non-scattering phase (and vice versa) numerous times." That is, trans-Neptunian objects could travel back and forth between the Kuiper belt and the scattered disc over time. Therefore, they chose instead to define the regions, rather than the objects, defining the scattered disc as "the region of orbital space that can be visited by bodies that have encountered Neptune" within the radius of a Hill sphere, and the Kuiper belt as its "complement ... in the a > 30 AU region"; the region of the Solar System populated by objects with semi-major axes greater than 30 AU. Sedna is not the only such object: (148209) 2000 CR105 (discovered before Sedna) and 2004 VN112 have a perihelion too far away from Neptune to be influenced by it. This led to a discussion among astronomers about a new minor planet set, called the extended scattered disc (E-SDO). 2000 CR105 may also be an inner Oort-cloud object or (more likely) a transitional object between the scattered disc and the inner Oort cloud. More recently, these objects have been referred to as "detached", or distant detached objects (DDO). There are no clear boundaries between the scattered and detached regions. Gomes et al. define SDOs as having "highly eccentric orbits, perihelia beyond Neptune, and semi-major axes beyond the 1:2 resonance." By this definition, all distant detached objects are SDOs. Since detached objects' orbits cannot be produced by Neptune scattering, alternative scattering mechanisms have been put forward, including a passing star or a distant, planet-sized object. A scheme introduced by a 2005 report from the Deep Ecliptic Survey by J. L. Elliott et al. distinguishes between two categories: scattered-near (i.e. typical SDOs) and scattered-extended (i.e. detached objects). Scattered-near objects are those whose orbits are non-resonant, non-planetary-orbit-crossing and have a Tisserand parameter (relative to Neptune) less than 3. Scattered-extended objects have a Tisserand parameter (relative to Neptune) greater than 3 and have a time-averaged eccentricity greater than 0.2. An alternative classification, introduced by B. J. Gladman, B. G. Marsden and C. Van Laerhoven in 2007, uses 10-million-year orbit integration instead of the Tisserand parameter. An object qualifies as an SDO if its orbit is not resonant, has a semi-major axis no greater than 2000 AU, and, during the integration, its semi-major axis shows an excursion of 1.5 AU or more. Gladman et al. suggest the term scattering disk object to emphasize this present mobility. If the object is not an SDO as per the above definition, but the eccentricity of its orbit is greater than 0.240, it is classified as a detached TNO. (Objects with smaller eccentricity are considered classical.) In this scheme, the disc extends from the orbit of Neptune to 2000 AU, the region referred to as the inner Oort cloud. Distribution of trans-Neptunian objects, with semi-major axis on the horizontal, and inclination on the vertical axis. Scattered disc objects are shown in grey, objects that are in resonance with Neptune in red. Classical Kuiper belt objects (cubewanos) and sednoids are blue and yellow, respectively. The scattered disc is a very dynamic environment. Because they are still capable of being perturbed by Neptune, SDOs' orbits are always in danger of disruption; either of being sent outward to the Oort cloud or inward into the centaur population and ultimately the Jupiter family of comets. For this reason Gladman et al. prefer to refer to the region as the scattering disc, rather than scattered. Unlike Kuiper-belt objects (KBOs), the orbits of scattered-disc objects can be inclined as much as 40° from the ecliptic. SDOs are typically characterized by orbits with medium and high eccentricities with a semi-major axis greater than 50 AU, but their perihelia bring them within influence of Neptune. Having a perihelion of roughly 30 AU is one of the defining characteristics of scattered objects, as it allows Neptune to exert its gravitational influence. The classical objects (cubewanos) are very different from the scattered objects: more than 30% of all cubewanos are on low-inclination, near-circular orbits whose eccentricities peak at 0.25. Classical objects possess eccentricities ranging from 0.2 to 0.8. Though the inclinations of scattered objects are similar to the more extreme KBOs, very few scattered objects have orbits as close to the ecliptic as much of the KBO population. Although motions in the scattered disc are random, they do tend to follow similar directions, which means that SDOs can become trapped in temporary resonances with Neptune. Examples of possible resonant orbits within the scattered disc include 1:3, 2:7, 3:11, 5:22 and 4:79. Models for a continuous formation throughout the age of the Solar System illustrate that at weak resonances within the Kuiper belt (such as 5:7 or 8:1), or at the boundaries of stronger resonances, objects can develop weak orbital instabilities over millions of years. The 4:7 resonance in particular has large instability. KBOs can also be shifted into unstable orbits by close passage of massive objects, or through collisions. Over time, the scattered disc would gradually form from these isolated events. 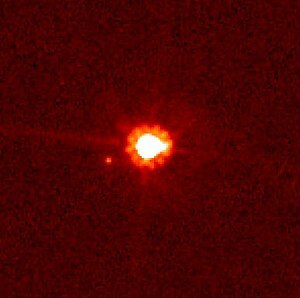 Astronomers originally supposed that the entire trans-Neptunian population would show a similar red surface colour, as they were thought to have originated in the same region and subjected to the same physical processes. Specifically, SDOs were expected to have large amounts of surface methane, chemically altered into complex organic molecules by energy from the Sun. This would absorb blue light, creating a reddish hue. Most classical objects display this colour, but scattered objects do not; instead, they present a white or greyish appearance. One explanation is the exposure of whiter subsurface layers by impacts; another is that the scattered objects' greater distance from the Sun creates a composition gradient, analogous to the composition gradient of the terrestrial and gas giant planets. Michael E. Brown, discoverer of the scattered object Eris, suggests that its paler colour could be because, at its current distance from the Sun, its atmosphere of methane is frozen over its entire surface, creating an inches-thick layer of bright white ice. Pluto, conversely, being closer to the Sun, would be warm enough that methane would freeze only onto cooler, high-albedo regions, leaving low-albedo tholin-covered regions bare of ice. The Kuiper belt was initially thought to be the source of the Solar System's ecliptic comets. However, studies of the region since 1992 have shown that the orbits within the Kuiper belt are relatively stable, and that ecliptic comets originate from the scattered disc, where orbits are generally less stable. Comets can loosely be divided into two categories: short-period and long-period—the latter being thought to originate in the Oort cloud. The two major categories of short-period comets are Jupiter-family comets (JFCs) and Halley-type comets. Halley-type comets, which are named after their prototype, Halley's Comet, are thought to have originated in the Oort cloud but to have been drawn into the inner Solar System by the gravity of the giant planets, whereas the JFCs are thought to have originated in the scattered disc. The centaurs are thought to be a dynamically intermediate stage between the scattered disc and the Jupiter family. There are many differences between SDOs and JFCs, even though many of the Jupiter-family comets may have originated in the scattered disc. Although the centaurs share a reddish or neutral coloration with many SDOs, their nuclei are bluer, indicating a fundamental chemical or physical difference. One hypothesis is that comet nuclei are resurfaced as they approach the Sun by subsurface materials which subsequently bury the older material. ^ The literature is inconsistent in the use of the phrases "scattered disc" and "Kuiper belt". For some, they are distinct populations; for others, the scattered disc is part of the Kuiper belt. Authors may even switch between these two uses in a single publication. In this article, the scattered disc will be considered a separate population from the Kuiper belt. ^ a b Morbidelli, Alessandro (2005). "Origin and dynamical evolution of comets and their reservoirs". arXiv:astro-ph/0512256. ^ Horner, J.; Evans, N. W.; Bailey, Mark E. (2004). "Simulations of the Population of Centaurs I: The Bulk Statistics". Monthly Notices of the Royal Astronomical Society. 354 (3): 798. arXiv:astro-ph/0407400. Bibcode:2004MNRAS.354..798H. doi:10.1111/j.1365-2966.2004.08240.x. ^ Sheppard, Scott S. (October 16–18, 2005). "Small Bodies in the Outer Solar System" (PDF). New Horizons in Astronomy: Frank N. Bash Symposium 2005. Austin, Texas: Astronomical Society of the Pacific. pp. 3–14. ISBN 1-58381-220-2. Archived from the original (PDF) on 2006-10-12. Retrieved 2008-08-14. ^ Luu, Jane X.; Marsden, Brian G.; Jewitt, David C. (5 June 1997). "A new dynamical class of object in the outer Solar System" (PDF). Nature. 387 (6633): 573–575. Bibcode:1997Natur.387..573L. doi:10.1038/42413. Archived from the original (PDF) on August 12, 2007. Retrieved 2008-08-02. ^ Davies, John Keith (2001). Beyond Pluto: Exploring the Outer Limits of the Solar System (PDF). Cambridge University Press. p. 111. ISBN 978-0-521-80019-8. Retrieved 2008-07-02. ^ a b Jewitt, David C. (August 2009). "Scattered Kuiper Belt Objects (SKBOs)". Institute for Astronomy. Retrieved 2010-01-23. ^ Schmadel, Lutz D. (2003); Dictionary of Minor Planet Names (5th rev. and enlarged ed. edition). Berlin: Springer. Page 925 (Appendix 10). Also see McFadden, Lucy-Ann; Weissman, Paul & Johnson, Torrence (1999). Encyclopedia of the Solar System. San Diego: Academic Press. Page 218. ^ a b c IAU: Minor Planet Center (2011-01-03). "List Of Centaurs and Scattered-Disk Objects". Central Bureau for Astronomical Telegrams, Harvard-Smithsonian Center for Astrophysics. Retrieved 2011-01-03. ^ Schwamb, M. E.; Brown, Michael E.; Rabinowitz, Davdi; Marsden, Brian G. (2008). "2007 UK126". Minor Planet Electronic Circ. 2008-D38: 38. Bibcode:2008MPEC....D...38S. ^ Staff (2007-05-01). "Discovery Circumstances: Numbered Minor Planets". Minor Planet Center. Retrieved 2010-10-25. ^ "Discovery Circumstances: Numbered Minor Planets (90001)-(95000)". Minor Planet Center. Retrieved 2010-10-25. ^ a b c d e Levison, Harold F.; Donnes, Luke (2007). "Comet Populations and Cometary Dynamics". In Adams McFadden, Lucy Ann; Weissman, Paul Robert; Johnson, Torrence V. Encyclopedia of the Solar System (2nd ed.). Amsterdam; Boston: Academic Press. pp. 575–588. ISBN 978-0-12-088589-3. Archived from the original on 2015-09-06. ^ a b c d e Morbidelli, Alessandro; Brown, Michael E. (2004-11-01). "The Kuiper Belt and the Primordial Evolution of the Solar System" (PDF). In M. C. Festou; H. U. Keller; H. A. Weaver. Comets II. Tucson (AZ): University of Arizona Press. pp. 175–91. ISBN 978-0-8165-2450-1. OCLC 56755773. Retrieved 2008-07-27. ^ a b c d e Gomes, Rodney S.; Fernandez, Julio A.; Gallardo, Tabare; Brunini, Adrian (2008). "The Scattered Disk: Origins, Dynamics and End States" (PDF). Universidad de la Republica, Uruguay. Retrieved 2008-08-10. ^ De Sanctis, M. C.; Capria, M. T.; Coradini, A. (2001). "Thermal Evolution and Differentiation of Edgeworth-Kuiper Belt Objects". The Astronomical Journal. 121 (5): 2792–2799. Bibcode:2001AJ....121.2792D. doi:10.1086/320385. ^ a b Morbidelli, Alessandro; Levison, Harold F. (2007). "Kuiper Belt Dynamics". In Lucy-Ann Adams McFadden; Paul Robert Weissman; Torrence V. Johnson. Encyclopedia of the Solar System (2nd ed.). Amsterdam; Boston: Academic Press. pp. 589–604. ISBN 978-0-12-088589-3. ^ a b Horner, J.; Evans, N. W.; Bailey, Mark E.; Asher, D. J. (2003). "The Populations of Comet-like Bodies in the Solar System". Monthly Notices of the Royal Astronomical Society. 343 (4): 1057–1066. arXiv:astro-ph/0304319. Bibcode:2003MNRAS.343.1057H. doi:10.1046/j.1365-8711.2003.06714.x. ^ Silber, Kenneth (1999). "New Object in Solar System Defies Categories". space.com. Archived from the original on September 21, 2005. Retrieved 2008-08-12. ^ Jewitt, David C. (2008). "The 1000 km Scale KBOs". Retrieved 2010-01-23. ^ a b Lykawka, Patryk Sofia; Mukai, Tadashi (2007). "Dynamical classification of trans-Neptunian objects: Probing their origin, evolution, and interrelation". Icarus. Kobe. 189 (1): 213–232. Bibcode:2007Icar..189..213L. doi:10.1016/j.icarus.2007.01.001. Archived from the original on 2011-03-10. Retrieved 2008-07-24. ^ Gladman, Brett J. "Evidence for an Extended Scattered Disk?". Observatoire de la Cote d'Azur. Retrieved 2008-08-02. ^ a b Gomes, Rodney S.; Matese, John J.; Lissauer, Jack J. (October 2006). "A distant planetary-mass solar companion may have produced distant detached objects". Icarus. 184 (2): 589–601. Bibcode:2006Icar..184..589G. doi:10.1016/j.icarus.2006.05.026. ^ a b c Elliot, J. L.; Kern, S. D.; Clancy, K. B.; et al. (2005). "The Deep Ecliptic Survey: A Search for Kuiper Belt Objects and Centaurs. II. Dynamical Classification, the Kuiper Belt Plane, and the Core Population" (PDF). The Astronomical Journal. 129 (2): 1117–1162. Bibcode:2005AJ....129.1117E. doi:10.1086/427395. Archived (PDF) from the original on June 25, 2008. ^ a b c d e Gladman, Brett J.; Marsden, Brian G.; Van Laerhoven, Christa (2008). "Nomenclature in the Outer Solar System". The Solar System Beyond Neptune. p. 43. Bibcode:2008ssbn.book...43G. ISBN 978-0-8165-2755-7. ^ Bertoldi, F.; Altenhoff, W.; Weiss, A.; Menten, K. M.; Thum, C. (2 February 2006). "The trans-Neptunian object UB313 is larger than Pluto". Nature. 439 (7076): 563–564. Bibcode:2006Natur.439..563B. doi:10.1038/nature04494. PMID 16452973. ^ Trujillo, Chadwick A.; Jewitt, David C.; Luu, Jane X. (2000-02-01). "Population of the Scattered Kuiper Belt" (PDF). The Astrophysical Journal. 529 (2): L103–L106. arXiv:astro-ph/9912428. Bibcode:2000ApJ...529L.103T. doi:10.1086/312467. PMID 10622765. Archived from the original (PDF) on August 12, 2007. Retrieved 2008-07-02. ^ Levison, Harold F.; Morbidelli, Alessandro (2003-11-27). "The formation of the Kuiper belt by the outward transport of bodies during Neptune's migration". Nature. 426 (6965): 419–421. Bibcode:2003Natur.426..419L. doi:10.1038/nature02120. PMID 14647375. Retrieved 2012-05-26. ^ a b Duncan, Martin J.; Levison, Harold F. (1997). "A Disk of Scattered Icy Objects and the Origin of Jupiter-Family Comets". Science. 276 (5319): 1670–1672. Bibcode:1997Sci...276.1670D. doi:10.1126/science.276.5319.1670. PMID 9180070. ^ Levison, Harold F.; Duncan, Martin J. (1997). "From the Kuiper Belt to Jupiter-Family Comets: The Spatial Distribution of Ecliptic Comets". Icarus. 127 (1): 13–32. Bibcode:1997Icar..127...13L. doi:10.1006/icar.1996.5637. Archived from the original on 2011-03-10. Retrieved 2008-07-18. ^ a b Hansen, Kathryn (2005-06-07). "Orbital shuffle for early solar system". Geotimes. Retrieved 2007-08-26. ^ a b Hahn, Joseph M.; Malhotra, Renu (13 July 2005). "Neptune's Migration into a Stirred–Up Kuiper Belt: A Detailed Comparison of Simulations to Observations". Astronomical Journal. 130 (5): 2392–414. arXiv:astro-ph/0507319. Bibcode:2005AJ....130.2392H. doi:10.1086/452638. ^ Thommes, E. W.; Duncan, M. J.; Levison, H. F. (May 2002). "The Formation of Uranus and Neptune Among Jupiter and Saturn". The Astronomical Journal. 123 (5): 2862–83. arXiv:astro-ph/0111290. Bibcode:2002AJ....123.2862T. doi:10.1086/339975. ^ a b c d e Tegler, Stephen C. (2007). "Kuiper Belt Objects: Physical Studies". In Adams McFadden, Lucy Ann; Weissman, Paul Robert; Johnson, Torrence V. Encyclopedia of the Solar System (2nd ed.). Amsterdam; Boston: Academic Press. pp. 605–620. ISBN 978-0-12-088589-3. ^ a b Brown, Michael E.; Trujillo, Chadwick A.; Rabinowitz, David L. (2005). "Discovery of a Planetary-sized Object in the Scattered Kuiper Belt". The Astrophysical Journal. 635 (1): L97–L100. arXiv:astro-ph/0508633. Bibcode:2005ApJ...635L..97B. doi:10.1086/499336. ^ Gladman, Brett J. (2005). "The Kuiper Belt and the Solar System's Comet Disk". Science. 307 (5706): 71–75. Bibcode:2005Sci...307...71G. doi:10.1126/science.1100553. PMID 15637267. ^ a b c Jewitt, David C. (2001). "From Kuiper Belt Object to Cometary Nucleus: The Missing Ultrared Matter". The Astronomical Journal. 123 (2): 1039–1049. Bibcode:2002AJ....123.1039J. doi:10.1086/338692.